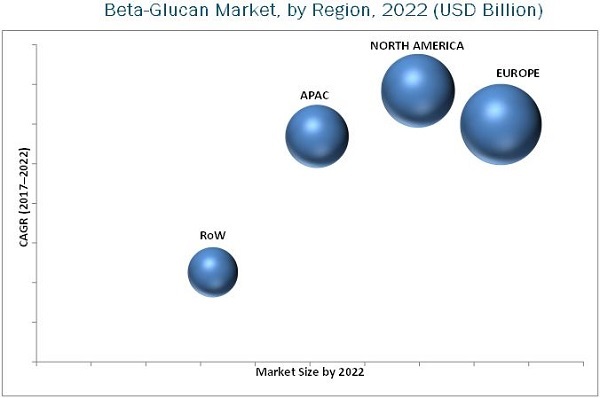 [128 Pages Report] Beta-Glucan Market is projected to grow at a CAGR of 7.57% from 2017, to reach USD 476.5 Million by 2022. The base year considered for the study is 2016, while the forecast period is from 2017 to 2022. The basic objective of the report is to define, segment, and project the global market size for beta-glucan on the basis of application, category, source, and region. It also helps to understand the structure of the market by identifying its various segments. Other objectives include analyzing the opportunities in the market for stakeholders and providing a competitive landscape of market trends, analyzing the macro & micro indicators of this market to provide a factor analysis, and projecting the size of the market & its submarkets, in terms of value and volume. This report includes estimations of the market size in terms of value (USD million) and volume (KT). 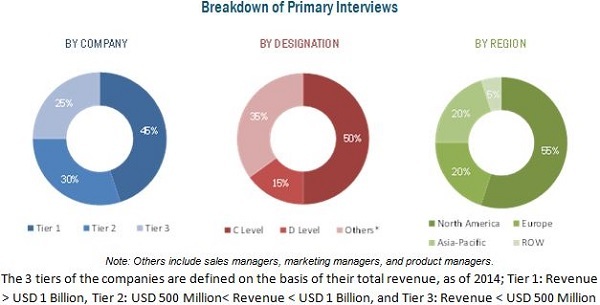 Both top-down and bottom-up approaches have been used to estimate and validate the size of the global market and to estimate the size of various other dependent submarkets in the overall market. The key players in the market have been identified through secondary research; some of the sources include press releases, paid databases such as Factiva and Bloomberg, annual reports, and financial journals; their market share in respective regions has also been determined through primary and secondary research. All percentage shares, splits, and breakdowns have been identified using secondary sources and were verified through primary sources. The figure below shows the breakdown of the profiles of industry experts that participated in the primary discussions. The key participants in the supply chain of the beta-glucan market are the product manufacturers, end-use industries, and raw material suppliers. The key players that are profiled in the report include Cargill (U.S.), Kerry Group plc (Israel), Tate & Lyle (U.K.), Royal DSM (Netherlands), Ohly (Germany), Frutarom (Israel), MilliporeSigma (U.S.), Super Beta Glucan (U.S.), Garuda International (U.S.) and Lesaffre Human Care (France). Product matrix, which gives a detailed comparison of the product portfolio of each company. Further breakdown of application in food & beverages, personal care, pharmaceuticals, and animal feed. Further breakdown of the Rest of European beta-glucan market into Poland, Sweden, and Russia. Further breakdown of the Rest of Asia-Pacific beta-glucan market into Thailand, Indonesia, Malaysia, and Japan. Further breakdown of the RoW beta-glucan market into South Africa and the central African countries. On the basis of category, the global market was dominated by soluble beta-glucan, followed by insoluble, in terms of value, in 2016. The rising standards of living due to improved economic conditions are expected to fuel the growth of beta-glucan, which in turn is driving manufacturers to increase the production, which is subsequently driving growth in the soluble category. The beta-glucan market, on the basis of source, is segmented into cereal, yeast, mushroom, and seaweed. Cereal and yeast are the major sources of beta-glucan. Beta-glucan from cereal such as oat and barley dominated the market in 2016. Barley fiber plays a beneficial role in improving human health. Europe dominated the market for beta-glucan extracted from cereal in 2016. The North American market is projected to grow at the highest CAGR for beta-glucan extracted from yeast. The beta-glucan market, on the basis of application, is segmented into pharmaceuticals, food & beverages, personal care, and animal feed. The pharmaceuticals segment accounted for the largest market share in 2016; yeast beta-glucan is increasingly considered as a nutraceutical ingredient for its positive effect on the immune system. The food & beverages sector is projected to grow at the highest CAGR during the forecast period. Popular uses for beta-glucans in the beverage category include fruit smoothies, dairy-alternative drinks, and powdered drink mixes. The European market accounted for the largest share for beta-glucan in 2016, owing to the increase in the demand for beta-glucan in countries such as Germany, the U.K., and France. However, North America is projected to be the fastest-growing market during the forecast period due to the growing consumer preference toward nutritious & healthy food products. The major restraining factor for the beta-glucan market is the inconsistency in regulatory norms governing beta-glucan. Health claims also differ at the country level, thereby hindering the usage of beta-glucan in pharmaceuticals as well as food & beverages. Another challenge faced by the beta-glucan industry is the high cost of extraction. Tate & Lyle (U.K.), one of the prominent players in the beta-glucan market, is acquiring new bio-science-based companies to focus on developing modified beta-glucan products and technologies. The company operates through two global divisions—specialty food ingredients and bulk ingredients. Beta-glucan products are offered under the company’s specialty food ingredient segment. The company has a strong presence in the U.S. and countries of Europe, with a foothold in Latin America and Asia-Pacific, and 30 location worldwide. It operates globally through its subsidiaries such as Tate & Lyle Argentina SA, Tate & Lyle Sweden AB, Tate & Lyle Brasil do SA, Tate & Lyle Chile Commercial Ltd, Tate & Lyle Trading (Shanghai) Ltd. (China), Tate & Lyle Italia Spa, Tate & Lyle Netherlands B.V., and Tate & Lyle Ingredients Americas, LLC (U.S.).